Braving the wilds of Washington D.C. While Ali is braving the wilds of the Serengeti, I’m braving the wilds of Washington D.C. You know — the herds of tourists, the temperamental and unpredictable congressional staff, the roaring protesters. I work right downtown on the National Mall at the Smithsonian’s National Museum of Natural History; I’m doing a fellowship here. And most days, I find shelter from the D.C. wildlife up in my office in the east wing. 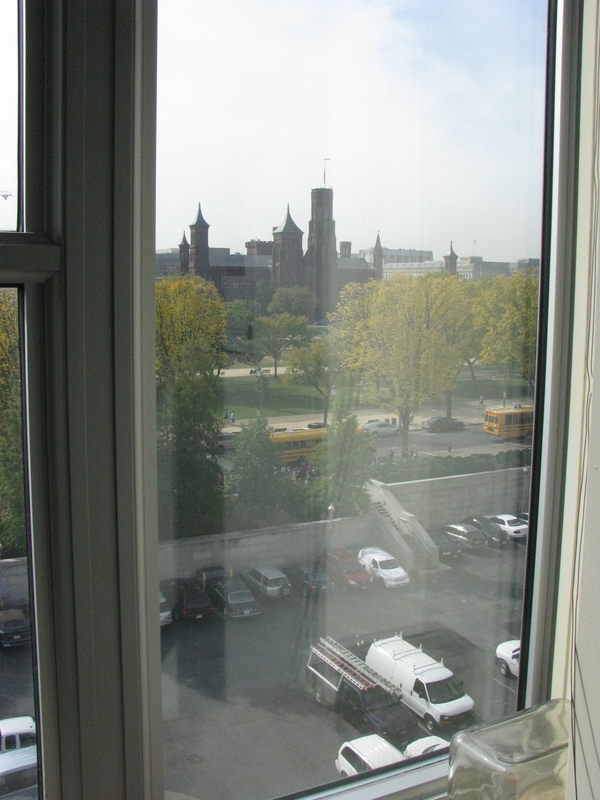 Overlooking the D.C. wildlife from the safety of the National Museum of Natural History’s east wing. But for the next couple days, I’m donning my pith helmet business clothes, hopping into my Land Rover onto the metro, and heading over to the kopjes Capitol Hill. I’m going to be lobbying. The Biological Ecological Sciences Coalition (BESC) holds an annual Congressional Visits Day, inviting scientists to come talk to congresspeople about the importance of federally funding biological research. Today is a training day, so that people like me can get clued-in to how the federal budget works and how to communicate with politicians. (My guess is that it’s not a good idea to spout off lots of numbers and use a lot of jargon.) Then tomorrow, we’ll be put in small groups and have meetings all day long with the staff of various senators and representatives. I’m participating in the Congressional Visits Day in part because I’m always curious about how things work, and the opportunity to learn more about how money gets from the coffers of the Treasury into the hands of the scientist on the street savanna is a draw. But I’m also participating because federal funding for the sciences is in trouble. It has been stagnant for the past decades and is now declining thanks to the Sequester. Over the next half-century (which I hope to experience), I see two major threats to our physical and financial well-being as a people. The first is the disruption of agriculture due to unavoidable factors like climate change and the introduction of invasive species. The second is the emergence and spread of zoonotic disease facilitated by unavoidable globalization. It is critical to understand the science surrounding these issues if we want to be able to adequately prepare for them, and the science to understand is fundamentally biological. So I’m leaving the quiet sanctuary of my office to head out and study talk to the lions policy makers. You’re a brave one! Good luck on your hunt. It’s a dangerous animal you’ll be stalking. Too bad you can’t take one of the lions with you to explain things. Best of luck! Indeed, a very dangerous, even lethal, variety of wildlife. Much as I envy your time in the Serengeti, for this experience you have all my sympathy!